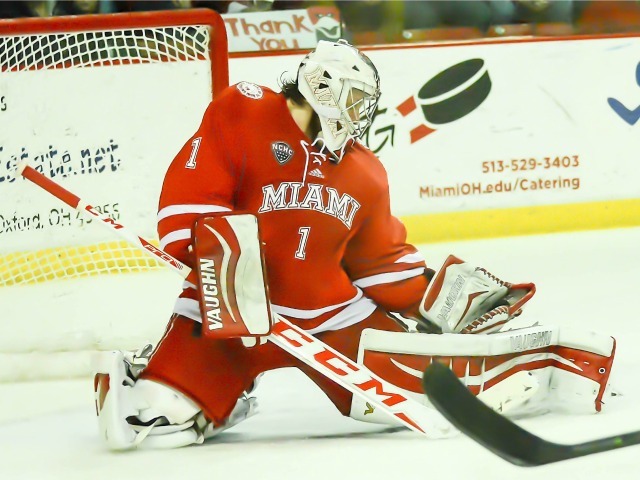 OXFORD, Ohio – Miami improved to 3-1-1 after a 1-0 win at St. Lawrence on Oct. 23. 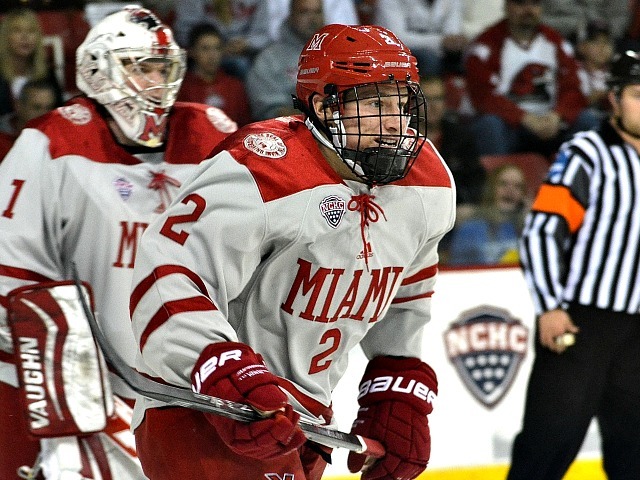 The RedHawks have recorded two victories since, posting a 2-9-1 mark in the past 71 days, including a 3-2 loss to RPI at Cady Arena on Saturday that extended the team’s winless streak to seven games. Although this weekend’s games are non-conference, Miami’s situation gets more dire with each loss. 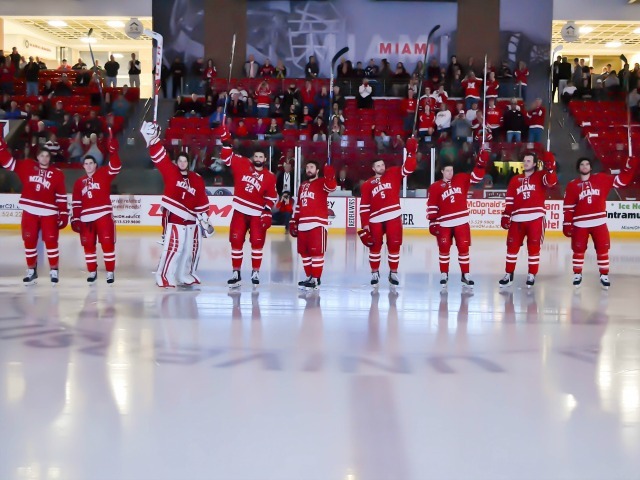 Now 5-10-2, the RedHawks’ PairWise ranking is 31st, a long way away from any kind of consideration for an at-large bid to the NCAA Tournament. On Saturday, Miami actually played pretty well. The team dominated the first few shifts, culminating in an early goal. The RedHawks were very good for large stretches of the second period as well. They hit at least four posts. It was the type of loss that, if Miami had played well overall the first three months, could be written off. Even the best college hockey teams don’t win every night. But teams that are four games below .500 don’t have that luxury. Because of the deep hole the RedHawks have dug themselves, every game from here through March is paramount. The tough schedule will give Miami leeway, but the team still has to win often against that tough schedule. The RedHawks play 14 conference games plus Sunday’s game against RPI (tied for 15th in the PairWise) and a home-and-home vs. Bowling Green (ranked 18th). And losing repeatedly in dramatic fashion can’t help this team’s psyche. Miami needs to finally score more than three goals, something it has yet to accomplish this season. Or win a game in the last minute. Or get in a galvanizing skirmish. Nothing that would warrant mass suspensions, mind you, just something, ANYTHING, to help boost confidence and get this team on track. The RedHawks lack offensive fire power this season, no doubt, but they don’t lack talent, and there’s no reason for them to have wins in fewer than one-third of their games thus far. – Miami’s 6-on-5 in the closing minutes was disappointing. Once the players got set up in the offensive zone they stood there and passed the puck among themselves repeatedly. No movement anywhere. And then they wondered why there were no open shooting lanes. 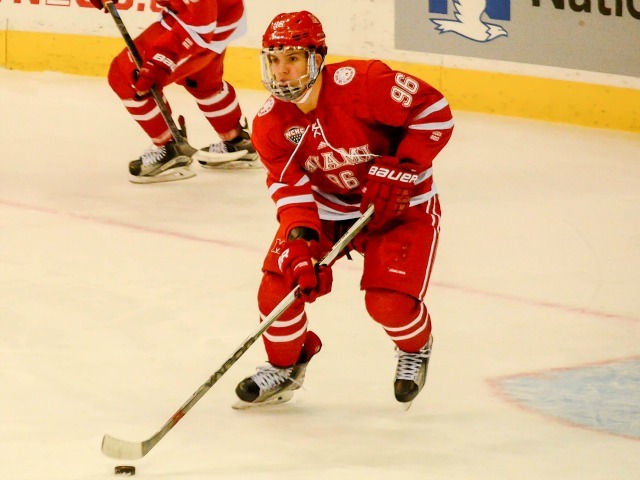 – It’s frustrating to see RPI come in boasting one 10-goal scorer and have him net for the Engineers’ first two goals. It’s no secret Riley Bourbonnais is the team’s best offensive weapon, and Miami was unable to slow him down. One could say the same about RPI vs. Jack Roslovic, who scored once and set up the other Miami goal. 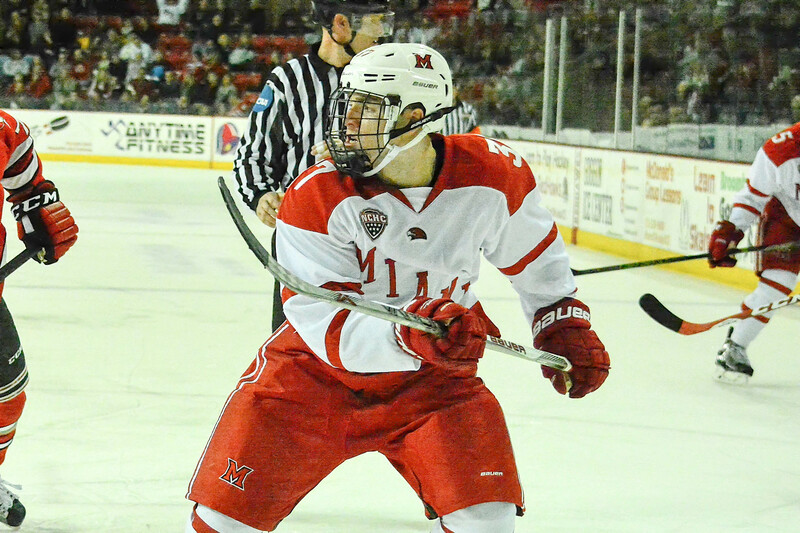 – Bourbonnais’ first goal came shorthanded and was a momentum killer for the RedHawks. Miami was up, 1-0 late in the first period with a chance to extend its lead via the power play, but Bourbonnais’ breakaway goal tied it and the RedHawks never led again. – On a positive note, this was one of the best games Anthony Louis has played all season. 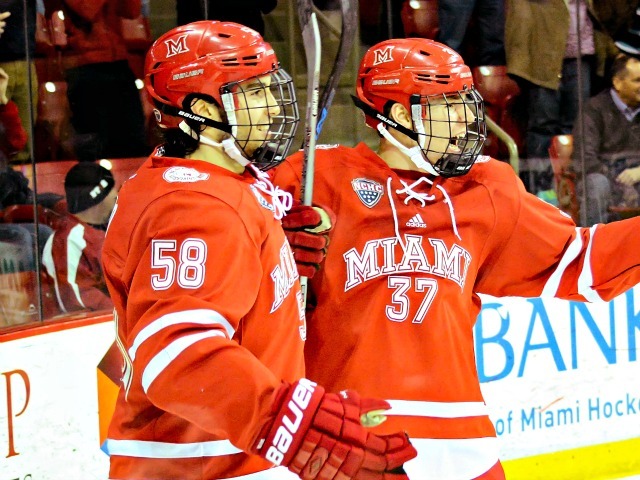 His pass to Jack Roslovic for Miami’s slam-dunk second goal was a thing of beauty. Louis was better in the second half of both his freshman and sophomore seasons, and Miami needs his offense now more than ever. – The listed attendance was 1,809 with the students out for the J-term, and that seems pretty generous. Unfortunately Miami has a lot of home games this month and won’t have a student section behind it. That figure could drop substantially on Sunday, going against the final week of the NFL’s regular season. FORWARDS: B-. 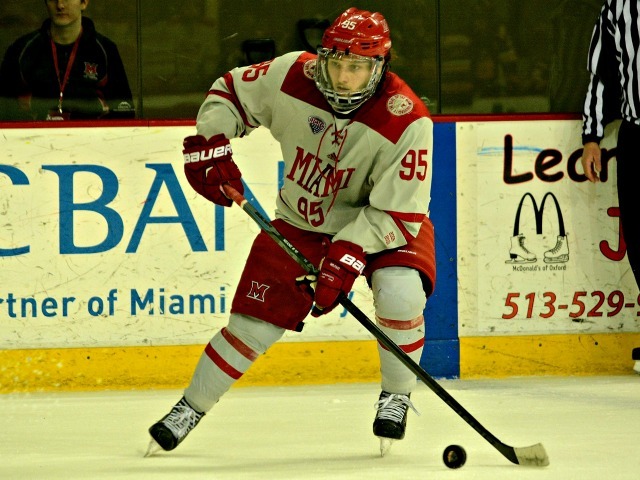 Louis and Roslovic were Miami’s best forwards and freshman Josh Melnick wasn’t far behind. This unit was very good at times and ineffective others. Same problem this team has faced all season: Miami has been unable to generate offense from its deeper lines. 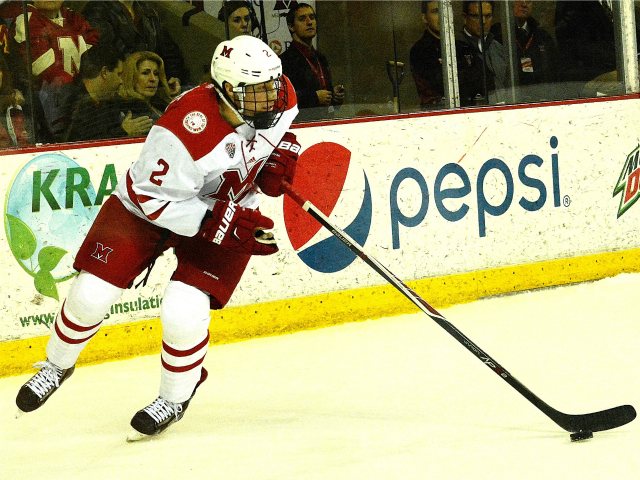 DEFENSEMEN: A. RPI manged just 17 shots. Colin Sullivan has been the odd man out a lot this season, but he was very solid on D. Bad year overall for Miami or not, senior Matthew Caito has saved his best season for last, although he ended up in the penalty box twice. And this unit was without sophomore standout Louie Belpedio, who is at the World Juniors in Finland. 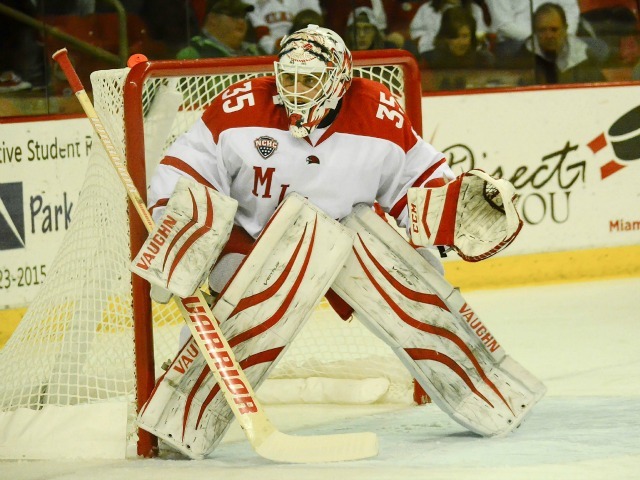 GOALTENDING: C-. Senior Ryan McKay just didn’t look like he seeing the puck that well all night. 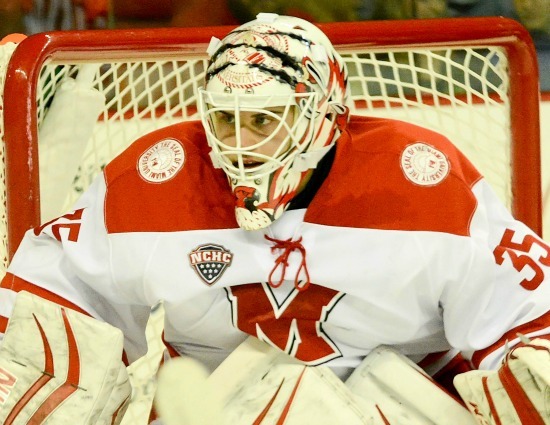 He made one spectacular save, stacking the pads on a point-blank shot, but he stopped just 14 of 17 overall. The first goal was a good shot on a shorthanded breakaway, but he still got beat. The second goal was pretty soft, hitting his glove and popping in, and the third he had no chance on. LINEUP CHANGES: Freshman Zach LaValle was back in the lineup for the first time since Nov. 13 with his upper-body injury. 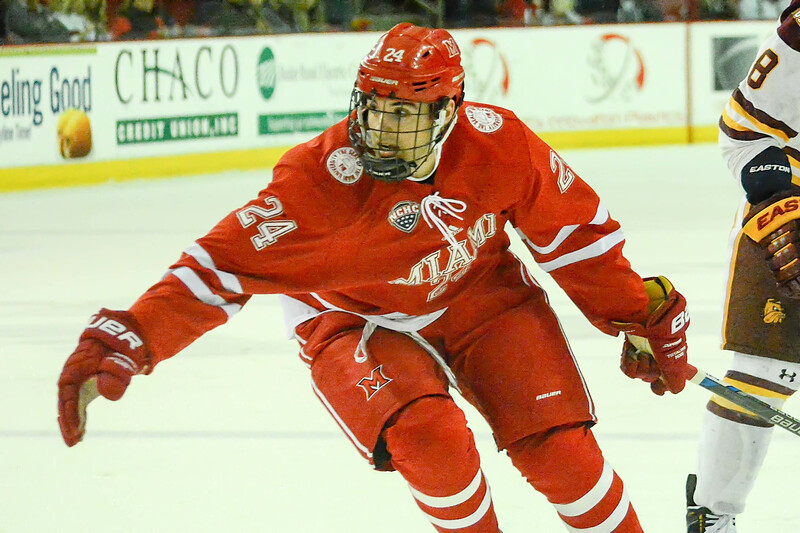 Freshman Ryan Siroky and junior Devin Loe were scratched, and Belpedio was obviously the missing D-man. Belpedio will miss Sunday’s game, and the smart money is on him being available next weekend.